Marcy will show us how to create her lovely glass feathers! If you subscribe to the Soda Lime Times, check out her tutorial in the March, 2019 issue, then come see her in person!! Please remember Beads of Courage desperately needs beads for their program! Please plan to attend and bring along as many donation beads as possible. See below for more information. Thank You!! Special! Beads of Courage Drawings!!! Beads of Courage needs beads!! Bring some to the meeting! Your name will be entered for the monthly drawing for a bead from the BOC Bead of the Month Program described above. Make your BOC beads on a 3/32" or larger mandrel and have no sharp edges. Do not use reduction glass, frits, powders or enamels that leave a metallic surface on the beads. Be sure they're fully annealed and cleaned. Children love fun beads in bright colors - but will appreciate any we donate! 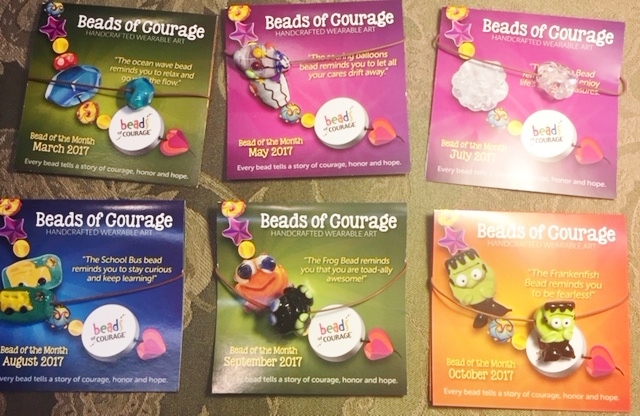 Check out their link: http://www.beadsofcourage.org/pages/glassbeads.htm and our SF page for more info. Have fun and develop your skills! TOOLS FOR TORCHTIME Southern Flames is asking members who may have duplicate or unused tools to donate them to our Torch-time area. This is the place in Beads by Design with torches that SF Members can rent. The donation of tools will make it easier for new beadmakers who have not yet purchased tools, or don't know what to purchase to work. REMINDER: We love animals but for safety reasons we cannot have them at SF meetings or SF Sponsored Events. 585 Cobb Pkwy S., Suite L, Marietta, GA 30060 - 3rd exit outside of I-285, North of Atlanta, is the South 120 Loop (a.k.a. Marietta Pkwy.) 2nd part of this exit, 120 Loop West, will carry you westbound back over I-75. Go 3 blocks on 120. Turn left on Cobb Pkwy and go about 1/2 block. Look for bowling alley and Easy Rental on left, turn and go in between them. Beads by Design, 770-425-3909, is behind Easy Rental.